Relish the scenic splendour of South Africa’s Cape Winelands, Klein Karoo and southern coastline with Garden Route tours packages from Springbok Atlas. Our Garden Route safari takes in the road less travelled through the Cape Winelands and the evocative Klein Karoo before traversing the Outeniqua Mountain Pass and descending to the lush Garden Route coastline. It is a circular route, ending back in Cape Town via the coastal roadway so you take in all the fantastic highlights of this beautiful region. Expect breathtaking landscapes, warm hospitality, whale watching (in season) and the chance to taste fine wines. Chat to us about our Cape Town safari and Garden Route trip today. Depart Cape Town and travel through the ‘Little Karoo’ and Montagu, a picturesque and historic spa town. En route, stop off in the town of Barrydale, where you will have the opportunity to visit a local farm school, interact with the children and teachers, spending time with them in the classroom learning more about the local farming community, before continuing to Oudtshoorn, the “ostrich feather capital” and centre of the world’s Ostrich farming industry. Overnight in Oudtshoorn. La Plume is a family-owned 1902 Victorian homestead on a working ostrich, alfalfa and vine farm outside the town of Oudtshoorn offering warm country hospitality and accommodations in refined style. After breakfast take a tour of the spectacular limestone caverns of the Cango Caves, one of the world’s great natural wonders, sculpted by nature through the ages. Return to Oudtshoorn for a guided tour and light lunch at an Ostrich Farm. Our journey continues over the scenic Outeniqua Pass to George, the administrative hub of the Garden Route area and then onto Knysna, known as the oyster box of South Africa, nestling on the banks of a beautiful lagoon in the heart of the Garden Route. Overnight in Knysna. 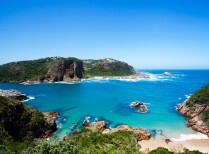 Located in the vibrant seaside town of Knysna and surrounded by beaches, forests and lakes – this elegant retreat is the perfect base from which to explore all the attractions of the world-famous Garden Route. After a leisurely breakfast you’ll enjoy a lagoon cruise to the Featherbed Nature Reserve, where you can take a trailer ride to the top of the Western Head to enjoy panoramic views of the town and lagoon, returning for lunch under the milkwood trees. The afternoon is at leisure to further explore this charming town set around a natural harbour lagoon. Overnight in Knysna. After a leisurely breakfast, travel via George and Mossel Bay to Albertinia, a town set against the backdrop of the majestic Langeberg Mountain Range. Enjoy an afternoon open vehicle game drive, at a malaria free private game reserve, that is home to an abundance of animal and birdlife, including the Big Five. Overnight in the region of Albertinia. The comfortable Garden Route Game Lodge is set on a family-owned and operated, malaria-free private game reserve on the foothills of the majestic Langeberg mountain range along South Africa’s infamous Garden Route. Your safari adventure continues with an early morning open vehicle game drive. 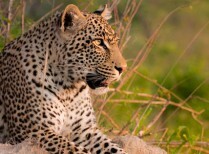 Your expert guide will endeavour to spoil you with sightings of the “Big Five”, general game and prolific bird life. Leaving the bush behind, your journey continues to the seaside resort of Hermanus, known as the heart of the whale route, offering the best land based whale watching (Aug-Nov) in the world. Dinner and overnight in Hermanus. A boutique-styled hotel, ideally positioned, just metres away from the cliff paths of Walker Bay that offer some of the best land-based whale-watching in the world. Enjoy an attentive stay in fine accommodation with easy access to town and the beach. The comfortable Garden Route Game Lodge is set on a family-owned and operated, malaria-free private game reserve on the foothills of the majestic Langeberg mountain range along South Africa’s infamous Garden Route. It offers 34 beautifully appointed lodge rooms and luxury thatched chalets, all equipped with the essential amenities expected of a luxury lodge. There are a number of superb dining options on offer—from a boma to on-site restaurant—ensuring a memorable dining experience. Guests can also enjoy wide range of activities, including open vehicle guided game drives, bird watching, reptile encounters as well as relaxing spa treatments at the spa. A boutique-styled hotel, ideally positioned, just metres away from the cliff paths of Walker Bay that offer some of the best land-based whale-watching in the world. Enjoy an attentive stay in fine accommodation with easy access to town and the beach. Spacious sea-facing rooms have en suite facilities, fantastic views and all necessary modern amenities. You can dine at the Pakistani-themed restaurant on site as easily as you explore the excellent options in town. There is a sparkling swimming pool in a tranquil setting that is ideal for relaxation. 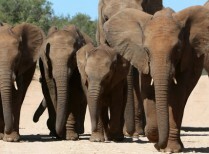 Southern Africa is well-known as one of the world’s best destinations for guided tours and safaris. The area is vast, and there are so many diverse attractions that you can get the most out of your holiday by accessing professional and trusted advice, itinerary design, planning, logistics and expert guidance. Springbok Atlas Tours & Safaris’ guided holidays are also sociable and fun, enabling you to connect with people while enjoying all the enthralling adventure, magnificent beauty and amazing variety that southern Africa has to offer. The many advantages of a guided holiday include that you are guaranteed high standards of safety, reliability and quality. Each hassle-free Springbok Atlas Tours & Safaris guided holiday experience takes in top destination highlights; and offers you safe luxury transport, excellent accommodation and fine dining, fully supported by professional, caring service. There’s no better way to encounter the best of Africa than to sit back and take it easy, knowing that all the details that make for a relaxing memorable holiday are completely taken care of. You are free to have fun - to fully explore, experience and enjoy a continent so rich in culture and heritage, peoples and places, astonishing wildlife and spectacular scenery. Visit South Africa’s third largest National Park, just 75 kilometres from Port Elizabeth. 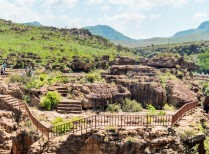 This scenic Park protects a finely tuned Eastern Cape eco-system that supports elephant, lion, buffalo, black rhino, spotted hyena, leopard, jackal, zebra, kudu and other species of antelope.